A post making its rounds on social media says that evacuees have the legal right to bring their pets into hotels during emergency situations. A viral post that has been shared since hurricanes Harvey and Irma in 2017 has resurfaced as Hurricane Florence works its way towards the East Coast. The post says evacuees taking refuge at a hotel or motel have the legal right to bring their pets in with them, even if the hotel says otherwise. Is this post correct? In emergency situations, are there laws in place that allow you to bring pets with you to hotels and motels that normally don't allow them? No, this claim is based upon a real law, but it's interpretation is wrong. Hotels and motels never have a legal obligation to allow any animals inside other than service animals. Unfortunately for those seeking a safe place for themselves and their pets, they cannot force a hotel to house them. The claim cites the Pets Evacuation and Transportation Standards Act of 2006 (PETS). That is a real law that was created to help sort out the confusion and safety of animals during emergency events. It does require local governments to have emergency plans for pets and sometimes requires they create shelters or other locations to house pets. However, it does not mandate any sort of housing requirements for hotels, motels or any other private housing. This post first started making its rounds in 2017 around the time that hurricanes Harvey and Irma hit the U.S.
FEMA didn't initially respond in 2017, but they have since posted an update on their "rumor control" page from the previous storms. Their post calls the posts False. 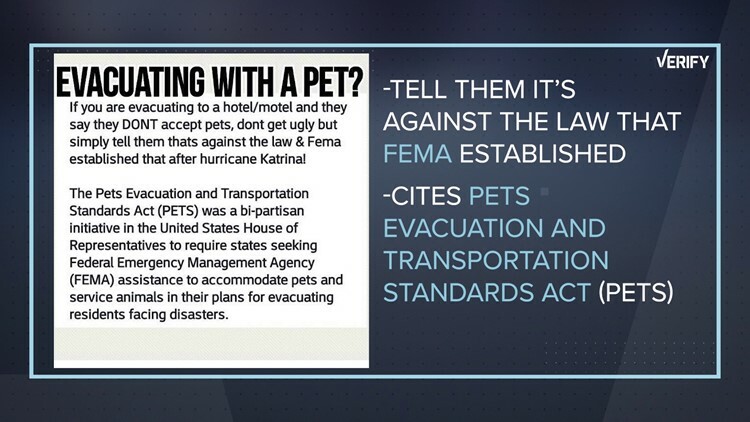 Hotels and motels participating in FEMA’s Transitional Sheltering Assistance Program do not fall under the Pets Evacuation and Transportation Standards (PETS) Act (Pub. L. 109-308 (2006)). Please call the hotel before you go and ask if pets are permitted. Hotels must accept service animals and individuals with access and functional needs should check with the hotel to ensure if accessible lodging accommodations are available to meet their needs." We can Verify the post is False. You cannot make a hotel house your pet even in emergency situations. For FEMA resources and tips on how to take care of your pets and how to seek shelter for them, click here.